Ricardo Lamas tore through his fellow featherweight to earn his crack at division king Jose Aldo (pictured). Unfortunately for Lamas, he didn’t showcase any of what got him there until it was too late on Saturday night at UFC 169. Once again, Aldo proved that he unleashes the deadliest leg kicks in the game. When he wasn’t battering Lamas’ lead leg, he was taking him down at will. Lamas tried to stage a late rally in the championship round, but it was a done deal at that point. When the dust settled on their one-sided shootout, Aldo walked away with an easy unanimous decision victory. After the scrap, Aldo requested a tango with lightweight champ Anthony Pettis. Pettis obliged. 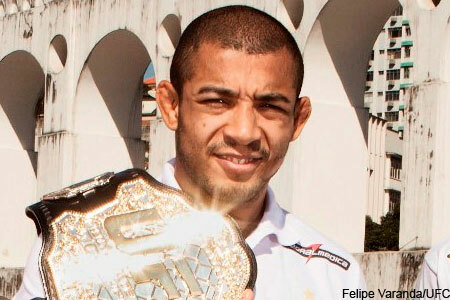 If the “superfight” goes down, Aldo will vacate his featherweight title to challenge Pettis.